When flowing through a constricted area of a pipe, a fluid’s velocity increases and its static pressure decreases. This principle is known as the Venturi effect. Today, we will take a closer look at this effect, including some of its applications. What Is the Venturi Effect? Skyscrapers are a common sight in any large city. When standing near the base of one of these giant structures, you may notice that the wind blowing around you is seemingly faster and stronger than elsewhere. One of the factors that can contribute to this wind acceleration is the squeezing of air through narrow spaces when several skyscrapers stand close to one another. This “channeling” effect is just one form of a larger fluid flow principle — the Venturi effect. The Venturi effect states that in a situation with constant mechanical energy, the velocity of a fluid passing through a constricted area will increase and its static pressure will decrease. The effect utilizes both the principle of continuity as well as the principle of conservation of mechanical energy. An animation illustrating the Venturi effect. Created with the COMSOL Multiphysics® software and the Particle Tracing Module. In the tube depicted above, a fluid flows from left to right at a constant volume flow rate. To maintain this flow, the fluid must be moved at the same rate, despite the constricted space in the middle of the tube. Therefore, the velocity of the fluid is increased, as the fluid needs to flow faster in the constricted area. In the case of the skyscrapers, a constant flow of wind can become constricted when forced through the spaces between buildings. Such constriction causes the wind’s velocity to increase at these points, producing a strong wind beneath the structures. The change in velocity also affects the pressure of the fluid. To understand why, we can turn to Bernoulli’s principle. This principle states that within a specified flow field, a decrease in pressure occurs when there is an increase in velocity. The pressure difference described by the Venturi effect is utilized in many different devices. An apparatus known as a Venturi tube is the foundation for such device designs. These tubes feature a narrow center and wider ends and, as we will discuss next, they can be used in a variety of applications. In the industrial and scientific fields, Venturi tubes are often used to measure the flow rate of a fluid. To do so, manometers are attached to different sections of the tube in order to measure pressure. The Venturi effect can then be used to calculate the flow rate from these measured pressure differences. Mixing liquid and gas components is another application of Venturi tubes. This is possible because the lower pressure inside the tube creates a pressure difference between the device and its surrounding environment. 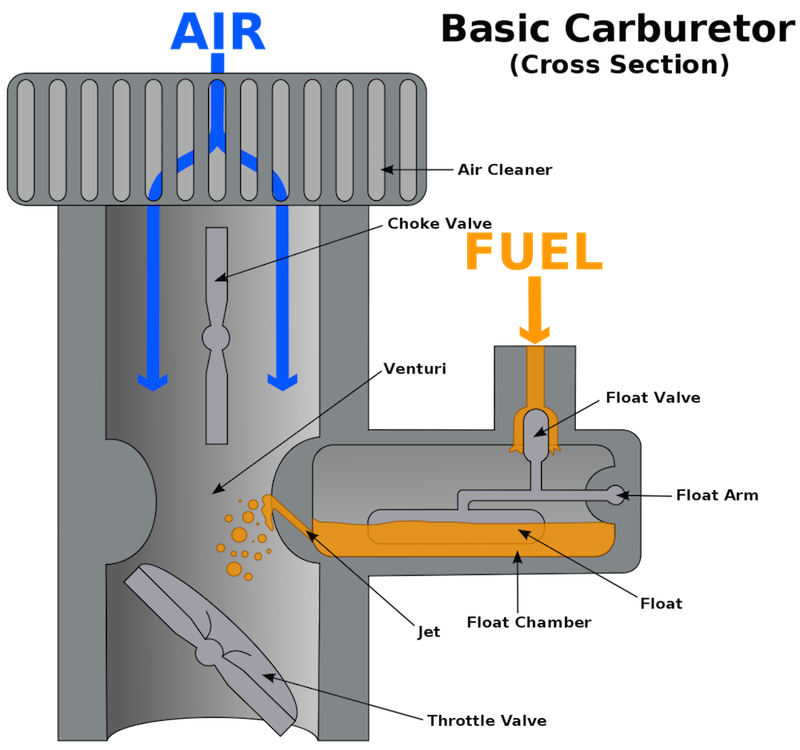 Substances outside of the Venturi tube are sucked into the low-pressure area, and gas and liquid components become mixed together within the device. The lower pressure at P2 can cause substances to get mixed into the Venturi tube. Take an automobile carburetor, for instance. In this case, the pressure difference causes fuel to be drawn into the air stream of the carburetor. When this occurs, air and fuel are mixed together, creating a fine spray of gas that allows the carburetor to function. A Venturi tube used in a carburetor. Image by K. Aainsqatsi. Licensed under Creative Commons Attribution-Share Alike 2.5 Generic, via Wikimedia Commons. The basic structure of a Venturi tube can be used to create a variety of other devices, such as an ejector that maximizes the mixing of water and ozone. This type of device can be used for wastewater treatment purposes, as described in this paper from the COMSOL Conference 2014 Cambridge.